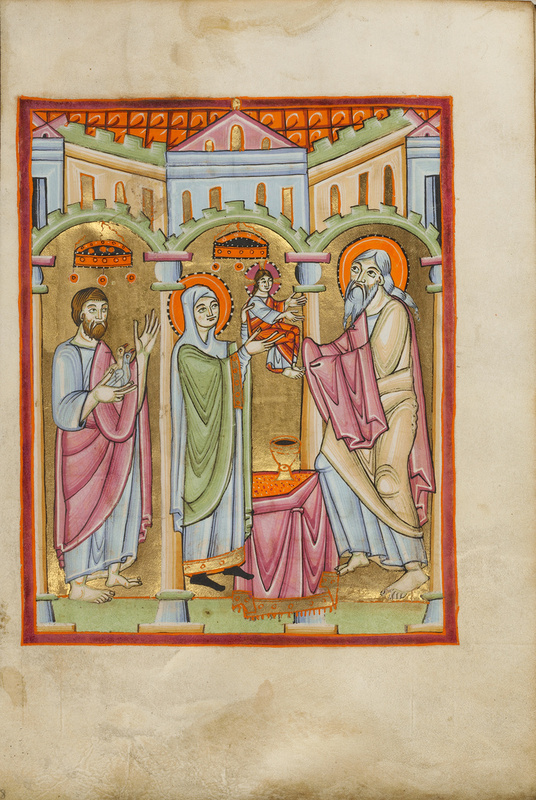 The miniature of the Presentation in the Temple in this Ottonian benedictional precedes the text for the feast of the Purification of the Virgin. In medieval art, the Purification, when the Virgin celebrated her ritual purification after giving birth by offering a sacrifice, was often conflated with the Presentation, because the two events would have occurred at about the same time. In the miniature, a series of large arches frames the figures of Joseph carrying the doves for sacrifice on the left, the Virgin holding the month-old but adult-bodied Jesus in the center, and the priest Simeon on the right. The architecture places the scene in the Temple in Jerusalem, but the altar and chalice refer to the Christian sacrament of the Eucharist. Jesus' placement above the altar further alludes to the Eucharist because during that rite Jesus' body and blood are understood to be present in the bread and wine that are consecrated on the altar. The figures are solidly placed and full bodied. In keeping with the benedictional's ceremonial function, the abstract pattern of stripes on their garments establishes a majestic rhythm in the image.